Ensure your project is completed on time and in a professional manner with expert excavation services from our company in Stamford, CT. At JCM Services, Inc., we specialize in providing professional-grade excavation services for commercial and residential projects. We offer a full range of excavation services for residential, commercial and industrial sites varying from complete site work, new road construction, drainage work, backfill services, demolition and much more. 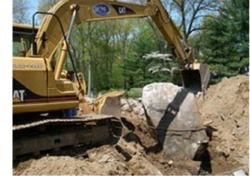 Let us help you on all phases of excavation for a new home construction, land development and more. With a fully certified team of operators and heavy equipment drivers, each job, large or small is guaranteed to exceed all your excavation standards. Proudly Serving: Fairfield County Connecticut and the surrounding area including: Stamford, Greenwich, Darien, New Canaan, and Westchester County.